There seems to be a plethora of Asian all-girl vocal groups where the girls just sing (or lip-sync) while doing choreographed dance routines during performances. However, there aren't as many Asian all-girl bands, where the members are performing the music as well as the vocals. Many of these bands are considered underground, because their music is usually harder and not compatible with the sound of the more "bubble gum" girl groups that are so popular throughout Asia. Even though Asian all-girl rock bands haven't enjoyed as much widespread media exposure in their countries that their pop counterparts have, some have earned international fanbases. The prime example above is Scandal; four hot female rockers from Osaka, Japan. 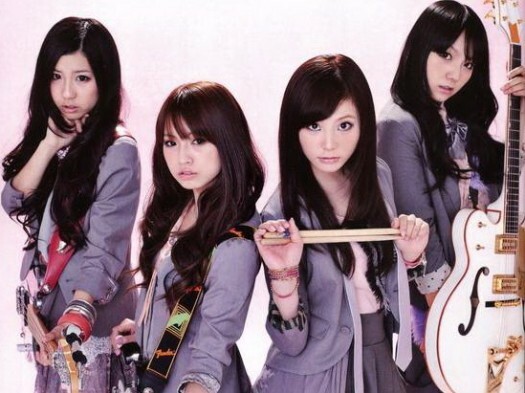 They are from left to right; Tomomi Ogawa (bass, vocals), Haruna Ono (vocals, guitar), Rina Suzuki (drums, vocals), and Mami Sasazaki (guitar, vocals). You won't find these ladies on the same bill with Morning Musume. While researching Hooters restaurants in Asia for last month's entry on Japanese Hooters girls, I happened across some photos of 24-year-old student and former Seoul Hooters Girl, Hanul Jeon. Very friendly and outgoing, Hanul (who also goes by "Hannah") worked at Seoul's Apkujung Hooters until March of last year. In May, she moved to Sydney, Australia, where she's been working as a waitress in a Japanese restaurant, while going to school to study Spanish. Even though she's currently undecided about continuing with her modeling, she eagerly agreed to be featured here with a brief (and her first ever) interview.